This week on Mobile Mondays, we bring you a classic showdown of Apple vs Android as we compare two of the most popular phones in the market – the iPhone 5 and the Galaxy S4. Apple and Samsung have a long standing feud that stems from the first generation Galaxy S allegedly infringing several patents from the original iPhone. The feud has resulted in numerous law suits and millions of dollars in legal fees that continue up to this day. 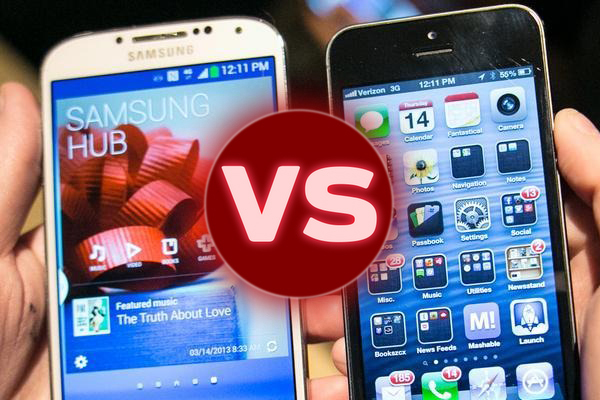 But at the end of the day, the real battle between Apple and Samsung still lies on which phone consumers will pick as their primary communication device and once again, we are faced with the question on which phone is the better. Fortunately, you’ve come to the right place, read on and check out our comparison of these two smartphones. Just like in our last shoot out, build quality is still the main differentiating factor between the Galaxy S4 and the iPhone 5. Again, the Samsung Galaxy S4 is predominantly built using plastic while the iPhone 5 is made from a combination of glass and metal. Both devices use Corning’s Gorilla Glass panel but the iPhone adds a layer of oleophobic coating that makes it less of a fingerprint magnet. Comparing physical dimensions, its crystal clear that the Galaxy S4 wins hands down as it is bigger in every way compared to the iPhone 5. This difference in size also accounts for the S4 being heavier than the iPhone despite its all plastic construction. In terms of the display, the two phones utilise different display technologies with the Galaxy S4 using a Super AMOLED display while the iPhone 5 has a LED-backlit IPS LCD screen. Moreover, the S4 packs a bigger screen with a higher pixel density than what Apple has to offer. Both phones are quite good snappers and takes high quality photos. But based on sensor size alone, the Galaxy S4 can shoot up to 13MP while the iPhone stops at 8MP. Samsung also puts a bigger front facing camera at 2MP while that of the iPhone is only 1.2MP. In terms of camera added features, Samsung also trumps the iPhone with its camera jam-packed with options and enhancements. 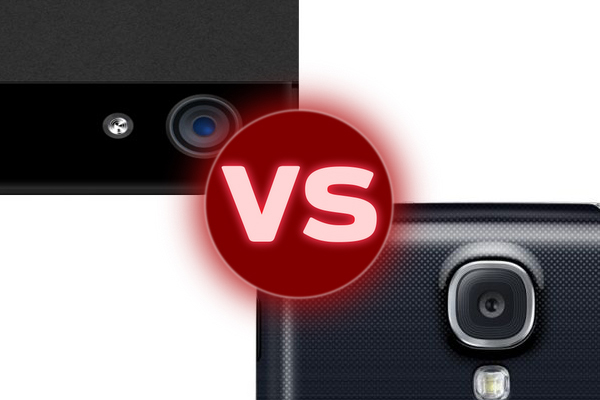 Performance is probably the most difficult criterion when comparing the iPhone 5 and the Galaxy S4. Even though the Galaxy S4 has more cores in its processors and 1GB more RAM than the iPhone, it’s quite difficult to gauge which of the two performs better as they run on two different operating systems. So at this point, it’s a matter of personal preference and probably experience. Last but definitely not the least, both the Galaxy S4 and the iPhone 5 are almost evenly matched when it comes to connectivity. The Galaxy S4 slightly ahead of the iPhone because it’s NFC-enabled and boasts an infrared port. Batter y on the other hand is a different story. The massive screen of the Galaxy S4 requires more juice than the 4.0-inch screen of the iPhone so it goes without saying that Samsung had to put a bigger battery on the S4 – 2600mAh to be precise which is almost double the size of that in the iPhone. Price-wise, both devices are in the premium price range with the Galaxy’s priced starting from $800+ while the iPhone 5 starts at $799. So have you made your choice? For any questions, reactions or suggestions, you can leave them in the comment box below. For other tech news and stories you can subscribe to our site or add us up on Facebook, Twitter, Pinterest and Google Plus.